If you were a crab, what color would you be? 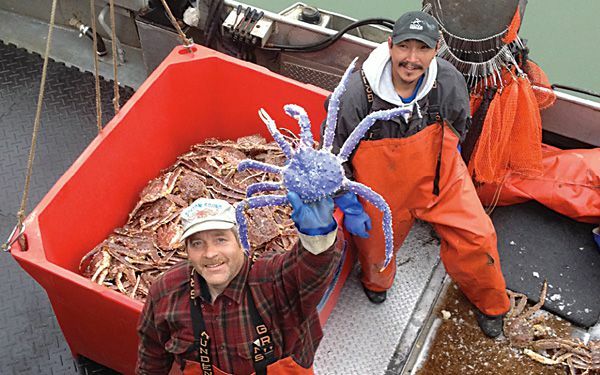 A rare blue-colored red king crab was found this summer. Frank McFarland found the crab in his pot when fishing July 4. The blue crab is being kept alive at the Norton Sound Seafood Center. People show up to have their photos taken with it. Scott Kent is an official with the Alaska Department of Fish and Game. He says he has no idea why the red king crab is blue. He suspects it's just a mutation. Kent says a blue crab "turns up once in a blue moon." Puffins have problems want to help these birds? that people found in a orange and white bucket. How does the crab stay blue in the picture of the crab? It is so weird that the crab is blue and it could be a mutation. But if it is, who did it? I would never mutate a crab it would look weird and the creature should be free to be its normal color. Why is the crab blue in the picture of the crab? 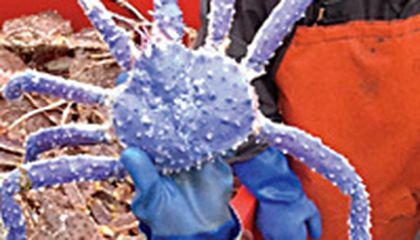 I think that the king crab is very nice color for its shell and that it looks like a mutant crab that was turned into that by a mad scientist.I Think that if iwas a crab that i would be a purple one instead of a blue one. But nothing else that crab is the best looking crab that i have ever seen in my hole out going life ever. I'd be a pink crab with nerdy glasses. I guess it would be kind of cool! You are right it would be so cool i would want a crab like that. If i had a crab i would want it to be pink.